Last weekend was Blue Ridge Dog Training Club's spring trial. Friday I took off of work to play. It was the worst day of our weekend. I made lots of mistakes and didn't do a good job of telling Cisco what to do. We seemed to get that all out of our system because by Saturday things were falling into place. We started the day with a great Open Standard run where we got third place after getting a refusal called (it was a bad front cross, but I don't think it should have been a refusal). Saturday afternoon, we had a perfect Jumpers run. It was our third Excellent A Jumpers leg which got us our AXJ -- our first excellent title! Berkley came with us on Saturday and Sunday (it's been about 6 months since he's done any agility). Saturday he forgot he actually had to get on the contact obstacles and ran right past the dog walk and a-frame with me. Sunday Cisco turned in two great runs. Neither was qualifying, but they were still good runs (we had a missed a-frame contact in open standard and one refusal in our first Excellent B jumpers run). Berkley did better on Sunday. We did knock a bar and run across the broad jump, but we did our contact obstacles and our weave poles. 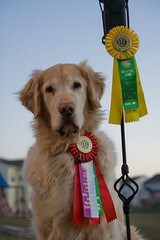 I'm still on an agility high from last weekend and wish we had signed up for something before mid-April. What Will You Do To Be Awesome? Tomorrow is the first International Day of Awesomeness where everyone can be awesome. I've been asking people all last week what they're going to be doing to be awesome, but haven't had an answer in return. I've finally decided what I'm going to do. First, I'm going to write those e-mails I've been meaning to to catch up with people I haven't spoken to in ages. Because it's awesome to to catch up with old friends. The second thing I'm going to do is make donations to the two people I know that are raising money for a good 'cause. So what is your feat of awesome going to be? Last Friday I attended the inaugural DC Talks event. DC Talks are the brain child of Jason Garber and Jackson Wilkinson and are a series of one day conferences geared towards the dc web community. This first conference, DC Design Talks was geared towards interactive designers and if this one was any indication, the rest should be a huge success. Next up (this spring) is supposedly the developer talks which I'm eagerly looking forward to. Following that, I think they're talking marketing and strategy. The design talks brought together some of the great talents in the region as speakers at the event. All nine speakers did an excellent job presenting. While my primary role is not a designer since I'm often working translating the designs to code, I think the conference provided me with great insight into the work of designers and gave me a lot of things to think about when implementing designs. As always, it was great to hang out with members of the dc web/tech community -- an inspiring group. Congratulations to Jason and Jackson for putting on a successful event!